The State Department remains unmoved by a request this week from an association of retired diplomats that it rethink its current position and publicly release its still-evolving reorganization plan. 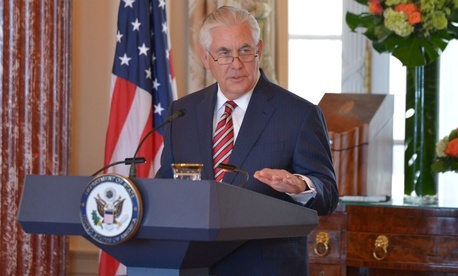 The letter added that the academy, like others in the Foreign Service community and in Congress, applauded Tillerson’s earlier announcement that he would fold some of State’s independent special envoys into their relevant bureaus. “Keeping your decisions from public view will only fuel the suspicion and low morale which now affects so many in the department,” the letter said. Tillerson’s planned reforms—executed both in response to the governmentwide White House reorganization mandate and a Trump budget that called for steep cuts at State—have caused heartburn for many in the diplomatic community. The secretary previewed the coming overhaul for the current staff in a Sept. 13 email, saying it would save $5 million to $10 billion in five years by curbing bureaucratic waste. As reported by Foreign Policy, Tillerson has been working with 200 State and U.S. Agency for International Development employees on recommendations such as overhauling the department’s dated information technology systems. The goal is to “align our foreign assistance and policy strategies, capabilities, and resources to meet the needs and capitalize on the opportunities of a rapidly evolving global landscape,” Tillerson’s email said. But, the retired diplomat wrote, “Tillerson has a problem, and it goes to the heart of his redesign efforts. Since employee participation is ‘essential’ to a successful redesign, it is particularly troubling that he has not directly engaged with his employees during the redesign effort in the most transparent way. He gave a couple of speeches but took no questions.” And Tillerson also shut down the two-way in-house employee forum in August.